My passion for fishing isn’t all about catching fish…it’s a passion for the tackle, rods, reels, boats, and gear. As a bass tournament angler, I need to trust that the equipment I am using is reliable, tough, and versatile. As a father of two young children, I need to be responsible and buy affordable products that meet my criteria. Sometimes, my search for quality products leads me in an unexpected direction, an unexpected pleasant surprise that will enhance the quality of my fishing. Let’s just say it pays to stumble through the “walleye” section of your local sporting goods store in search of an elite bass fishing finesse rod. After my 2011 tournament season, I did an inventory assessment and realized that I needed another deep water spinning rod that would favor my finesse tactics I employ in highly pressured lakes. My search started with the popular names in bass fishing and I came to the conclusion that I would need to spend at least $100 to buy a new rod. Being the budget shopper that I am, I started to re-think my criteria for this particular rod. It needed to be light, durable, and have the ability to handle large fish on light line. In my opinion, this seems to be the exact criteria that walleye fisherman have for their rods, so I started to research local manufacturers that catered to our state fish. Fortunately, I came acrossJason Mitchell’s Elite Series spinning rods and for $79 I couldn’t be happier. Under the Clam Outdoors umbrella, I knew that this product was for a serious Minnesota sportsman. So why does Jason Mitchell’s Elite Series spinning rod, traditionally a walleye rod, adorn the front deck of my Ranger bass boat? Performance. I had the opportunity this past weekend to give it a thorough workout on the Mississippi River Pool 4 and I pleased to report that it exceeded my expectations. It is light enough to fish with for hours, yet strong enough to battle smallmouth bass in tough current. The Hyper Modulus Graphite Technology in the rod blank proved to be extremely sensitive and responsive to the 8 pound fluorocarbon line I was using. 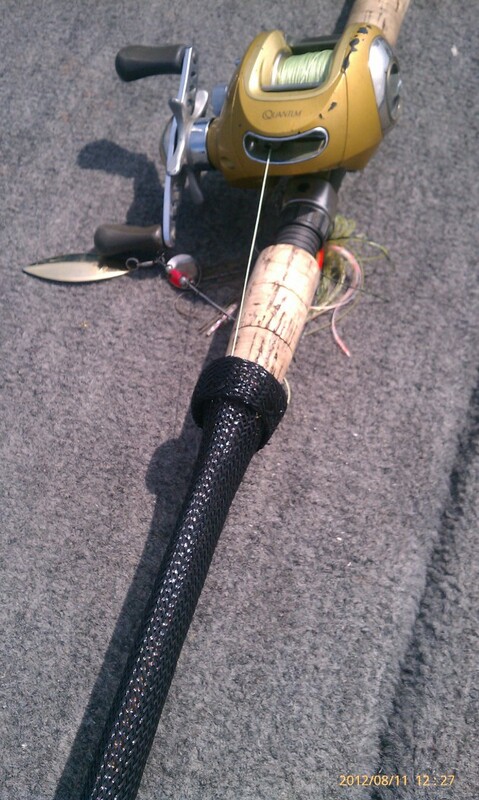 The cork grip was very comfortable and the locking graphite reel seat keeps my reel extremely secure and straight. One thing I have learned through competitive fishing is that it pays to be different. Thinking outside of the box is what separates tournament winners from the rest of the field. If I can spend less money for an equal, if not greater quality rod, then I will have additional dollars in my budget to buy extra bags of those darn plastic baits the bass love. All I am concerned about is performance; not titles, brands, or fancy colors. Don’t make the mistake of falling victim to species specific tools of the trade. If you want a rod that will handle big bass and earn you big checks, put a Jason Mitchell Elite Series rod in your hand today.